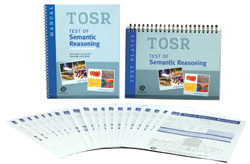 The Test of Semantic Reasoning (TOSR) is a new, standardized vocabulary assessment for children and adolescents ages 7 through 17. Semantic reasoning is the process by which new words are learned and retrieved from one's lexicon through analysis of multiple images that convey various contexts of the word's meaning. The TOSR was developed by two practicing speech-language pathologists and builds on their successful vocabulary instruction app, InferCabulary. It includes 90 sets of four high-quality color photographs that reflect a vocabulary word in a variety of contexts. The individual must use semantic reasoning to analyze the pictures and then select the single word from a choice of four that best represents the multiple contexts of the word represented by all the images. Information obtained from this assessment can provide educators, psychologists, and speech-language pathologists with information on children and adolescent's basic receptive vocabulary knowledge, as well as their higher order thinking and reasoning in the semantic domain. 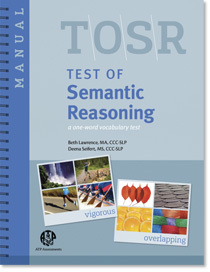 The TOSR incorporates the easy administration and scoring of traditional one-word vocabulary assessments. The test is untimed and can generally be administered in about 20 minutes. Age-related starting points and ceilings ensure that only a subset of items will need to be administered. Scoring is straightforward, generally taking less than 5 minutes. Raw scores are reported as standard scores, percentile ranks, and age equivalents.